Things are coming along in the boys' room update. It took me FOREVER just to decide on the perfect paint color. I knew I wanted gray, but you know how gray goes. There are so many undertones to consider. I finally decided on Light French Gray from Sherwin. It has a bit of a blue undertone, but not so much that it feels "blue". It ended up being PERFECT with the rooms color scheme! My oldest son was tired of the car theme, and is BIG TIME into football! Currently he has started running up and down my staircase every morning in preparation for summer practice. Haha SO you can imagine the sounds I get to wake up to :) I LOVE him and his determination! Awhile ago my hubby and I watched the movie Leatherheads. It's Hilarious!!! 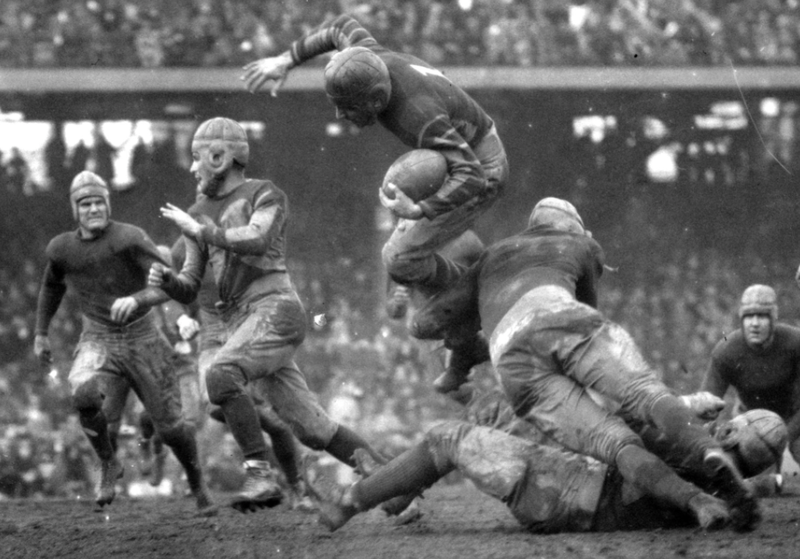 I guess at that time in history pro football was for the "old men" - crazy to think that was ever the case. Anyway, the leatherhead era was very popular in the college arena, and since we are college football fans, I knew that was the direction I wanted to go with the boys' room. I threw a twist in the room, when I decided to use gray and navy, instead of brown as the accent color. When I found the gray football pillow it was as if my color choice was made in heaven! Vintage football is so classic and so far we are off to a good start with adding a touch of an era gone by! Here is a Sneak Peak! Can't wait for it to be DONE! Love this idea...classic boy and totally masculine. Where did you get the Just be awesome wall art? I also loved the update of this room. AMAZING! I love the bedding! Can you tell me where you found it? Thanks!